Pirates Island Golf- For our family, a round of putt-putt golf is a must on vacation. We've putt-putted in San Diego, Tennessee, and even Hawaii, so naturally: we had to putt-putt while in Hilton Head. My younger brother, the self pronounced connoisseur of the game, chose Pirates Island Golf. We went there when we visited Hilton Head two years ago, and it was just as fun. Its so fun for the whole family, and the golf holes are really interesting and fun! Plus, if you get a hole in one on hole 8, you get a "piece of treasure." Of course, my dad did, and received a free game as his prize. The good news? The man at the counter said it never expires. He said he's seen people redeem free game coins from 40 years in the past! Woah-- that's a long time to hold onto a plastic coin if you ask me. Kayaking- This was my choice for the trip, and it was so much fun. We went to a company located at the Broad Creek marina, and had a nice lunch at a waterfront restaurant before taking to the water. 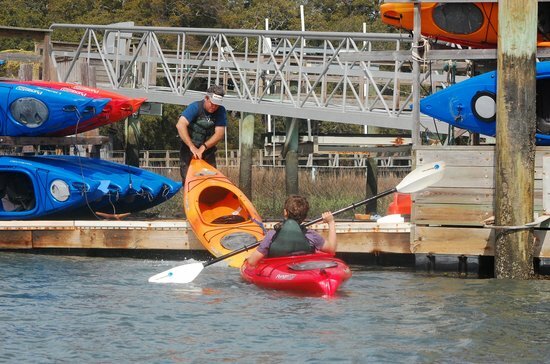 It was lots of fun, and we paddled down to Shelter Cove Marina. Just when I was beginning to complain about not seeing dolphins: we saw two! They popped up every few minutes before eventually swimming away, but it was such a cool sighting. The way back was much easier since we were going with the tide and wind. The rates were very reasonable as well: $15 for a single kayak and $20 for a double. Cycling- In case you don't notice the constant bicycle rolling by the main street in Hilton Head: biking is a big thing on the island. You can ride your bike to the beach, on the beach, to eat, and to do just about anything. I thoroughly enjoyed riding my bike around during the week, and we had lots of fun cycling up to get frozen yogurt at Yo Addiction. During my long run, I also found out you can ride your bike on the Pinckney Island National Wildlife Refuge (RELATED: Unforgettable Runs: Pinckney Island National Wildlife Refuge), which I would definitely recommend. I absolutely loved my run there! Running- How could I leave this out! The bike paths were interesting to explore, as was the beach. The most fun however, was my run on Pinckney Island. Whether you walk, run or ride your bike there: I would highly recommend it (RELATED: Unforgettable Runs: Pinckney Island National Wildlife Refuge). The Beach- This is a given, but an absolute must-- especially if your from a landlocked state like Ohio. Make sure to soak up the sun (but wear sunscreen!) and go early to take a relaxing walk on the beach in the morning. Yo Addiction- I am a strong advocate of frozen yogurt. If you keep the toppings limited to fruit, it is an extremely healthy dessert. This place was so much better than any frozen yogurt shop I've ever visited though. It had limitless toppings and very different flavors. There were lots of berries that I put on my frozen yogurt, as well as cheesecake bites, chocolate covered acaí berries, maple syrups, cereals, and tons of other toppings, that I didn't try. We rode our bikes there twice. The Quarterdeck- I'm not a big "foodie," but this restaurant was really fun to eat at. It was right by the lighthouse at Harbour Town, and had a great musician playing fun songs throughout the evening. The seafood was great-- and I know my seafood-- and it was relaxing after a long day of fun.